Sorry for writing in English (I understand Swedish but do not speak or write fluently). 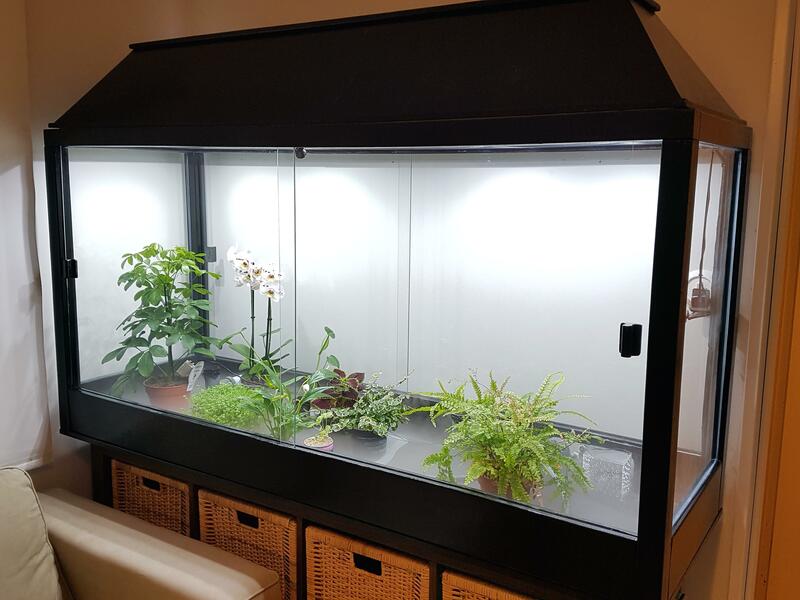 I recently built a 760 l vivarium and planted over the weekend. I am now letting the plants grow in a bit and checking that the environment is stable and that there is no problems with the enclosure (humidity stable at 85-93% and temperature up to 26.2 degrees Celsius in the day and down to 24 at night - all helped to be kept in check with fans and a humidifier controlled buy a raspberry pi - data available here: https://thingspeak.com/channels/436974). Note I have been checking this only for a week but the temperature in the room is relatively constant during the year and I expect very little change. 1. Is 26 degrees Celsius still OK for D.tinctorius Azureus? Most of the information mention their range of temperature is 22-27 degrees - but is this the range where they are comfortable? 2. When is the best time to acquire frogs? I was planning to let the vivarium settle for 3 months but is this enough and should I do anything else in the meantime to prepare? 3. Where is the best place to buy D.tinctorius Azureus in Sweden (this is the species that I am interested in)? 4. Is there any place to obtain flightless fruit flies? I read that there are cultures of these but have not been able to find any (I have some normal fruit fly cultures that I feed to some ant I keep but there is an obvious problem with them being able to fly ). Any information would be appreciated (English or Swedish - sorry again for writing English on a Swedish forum). Re: Bästa stället att skaffa grodor? and 3 more beginner questions. 1. Yes, but 27 should only be reached as a peak temperature. During the night, it is not a problem at all if it goes down to 20 degrees. 2. 3 months is definitely enough. For beginners, I'd say everything above 1 month is OK, when you have gathered some experience, 1 minute is enough. 3. Unless you can simply visit someone who has young Azureus my suggestion would be the frog day in autumn in Stockholm. If you start looking now, someone should with high probability be able to reserve some for you. You can find fruit flies at any terrarium fair in Sweden. There are some 10+ fairs around Sweden every year. If you live in a bigger city you May Likelly find a shop that have or can order for you. Now in summer you can also purshase online. Herpers choice is just one example. Or you can ask for someone with fogs close to you to get some. To make the terrarium better for frogs, add a lot more plants and Hilding placed like Woods, corc bark etc. Add black background tape or even better, add 3 d background inside. I just finished planting the first set of plants and I added several pieces of wood and bark. I hope to have a bit of a forest of plants before I get any animals (but already it is much more lush than in the picture). But I will ensure that I have hiding places as you suggested. Thanks for the tip on the flies. Just wanted to correct Frank a little here, the Frog day this autumn is in Jönköping the 27/10. Oops, I still had the recent frog day on my mind. Good to have an observant chairman.